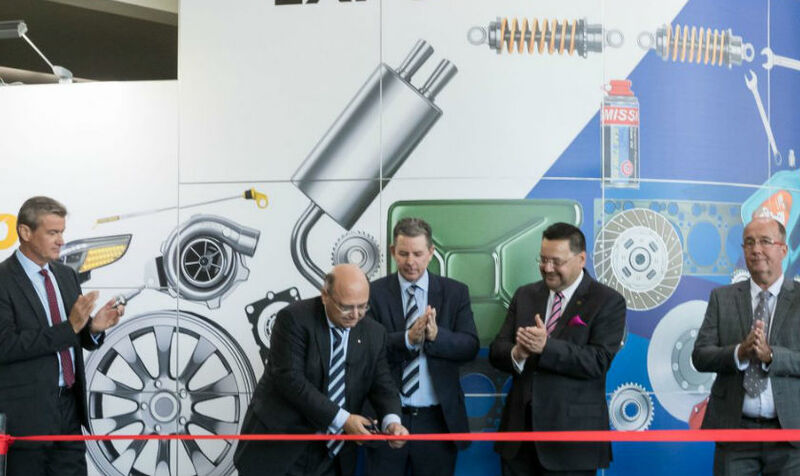 The high quality of exhibitors’ stands and the business improvement focus of the seminar program attracted almost 11,000 industry visitors to the Australian Auto Aftermarket Expo and the co-located Collision Repair Expo held at the Melbourne Exhibition Centre from 6 to 8 April 2017. Presented biennially by the Australian Automotive Aftermarket Association (AAAA), the Expos offered visitors the chance to experience thousands of products and services demonstrated on 437 stands, learn new ways to make their businesses perform better during the two day seminar program, and provided unprecedented networking opportunities for sharing ideas with industry colleagues. AAAA Executive Director Stuart Charity praised the performance of the exhibitors for presenting a show of international standard as well as the engagement of the visitors for embracing the “build a better auto business” show theme. “There are about 25,000 workshops in the auto aftermarket across Australia. To attract visitors from around a third of these businesses to the Expos in Melbourne is a fantastic result,” he said. “While around 74% of the visitors registered specifically to attend the Australian Auto Aftermarket Expo, most people take advantage of the opportunity to see both shows. “The atmosphere throughout the exhibition halls was tremendous. A lot of business was done and even more business leads were generated. Given the challenges faced by the automotive industry, the Expos highlighted the positive vibe charging through the aftermarket. “Confidence in the industry is returning and that was reflected in the increase in the number of attractive custom designed stands. Although our Expos are not as large as the American SEMA and international Automechanika shows, this year Expo exhibitors lifted the bar making our event more than comparable in terms of their investment in stunning looking stands,” said Stuart Charity. One amazing Expos statistic relates to the seminars. The “improve your auto business’ themes and topics for the Seminar Program attracted 2,500 delegates. “The standard of presentations and discussion was exemplary. We thank all those that contributed to this important learning and sharing experience,” said Stuart Charity. “The Australian Auto Aftermarket Innovation Awards Breakfast and Australian Auto Aftermarket Excellence Awards Banquet enjoyed record attendances attracting a total of 1200 guests to celebrate with the winners. These functions are an important part of the networking that takes place at the Expos. “Another successful contribution to networking at the Expos was the opportunity created by so many industry organisations choosing to co-locate their events at the shows. There were more than fifty conferences, meetings, workshops and launches held over four days filling every ‘nook and cranny’ of the Melbourne Exhibition Centre,” said Stuart Charity. At the official opening of the Expos, the first response from Federal Minister for Industry, Innovation and Science, Senator Arthur Sinodinos, on entering the exhibition hall was “wow, wow, and wow” as he looked in each direction. Stuart Charity said the Expo provided a great opportunity to showcase the scale and scope of the sector Australian to Minister Sinodinos. “The Minister talked to exhibitors about their manufacturing and export strengths and opportunities as well as some of the road blocks to growth in the sector,” said Stuart Charity. “The exhibitors’ displays impressed Senator Sinodinos and gave him a different and more comprehensive perspective of the aftermarket. We look forward to continuing the conversation as we progress plans for initiatives such as the Australian Automotive Innovation Lab. “The overwhelming mood of exhibitors was very positive. They were pleased with the enthusiasm of visitors and many said it was the best Expo yet,” said Stuart Charity. The AAAA launched the next phase in its continuing Choice of Repairer campaign at the Expo. This step reaches out to consumers with information kits given free to independent service and repair workshops that are AAAA members. Stuart Charity said this kit correctly presents the customers’ legal position with respect to new car servicing by independent workshops. “The consumer brochure will help independent workshop staff explain to customers that log book servicing undertaken by qualified staff in accordance with the manufacturers specifications will not impact the owners’ new car warranty,” he said. “This customer information kit makes it clear that there is no requirement under Australian Consumer Law for a vehicle to be serviced by an authorised dealer or need to fit ‘genuine’ parts in order for the consumer guarantees to apply. “This new Truth about new car servicing kit is comprehensive and self explanatory. All information has been verified by the Australian Competition and Consumer Commission. At Expo the AAAA also announced a new major education and information exchange event for the aftermarket parts, service and repair sector. Titled the Autocare 2018, this new convention will address the theme Disruption, Innovation, Rejuvenation. World class Australian and international speakers will cover the topics that matter to the future of all businesses and professionals in the automotive industry. Stuart Charity said this event will be held at the new state of the art International Convention Centre in Darling Harbour, Sydney on 4 and 5 May 2018. “With thousands of automotive professionals attending this convention, it will provide industry suppliers with an unrivalled business development opportunity in this large and important market. We hope to build on the synergies we enjoy at the Expo with the collision repair sector and will welcome their participation in the convention,” he said. “The plan is to hold the Autocare 2018 Convention in Sydney in 2018 and the hugely successful Australian Auto Aftermarket Expo and Collision Repair Expo at the Melbourne Exhibition Centre from Thursday 4 April to Saturday 6 April 2019. “With this duo of major national events, the AAAA continues to provide leadership for the aftermarket sector through business development focused initiatives,” said Stuart Charity.